I love a room makeover, especially those that have big impact but take very little time. A few months back I made over my Mother’s bathroom and laundry room in one day with little more than a gallon of paint. A few new items and a little organizing made a huge impact in this small space. You can read about the makeover here. 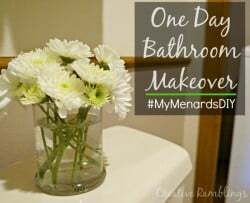 Today, I’ve rounded up 23 Quick and Easy Bathroom Updates to inspire your next makeover. Click on the image above to see my full round-up on Hometalk. These are a few projects I love. These industrial towel rods would make such a statement in a bathroom. Sometimes the easiest way to update a room is with wall art, I love these FREE chevron printables. Turning baskets into open shelves, how clever! I love this look and functionality. Be sure to see all these quick and easy updates on Hometalk. Have you updated a bathroom lately? I’d love to hear about your makeover. I’m in the process of redoing my bathroom! How fun! Hope you got some inspiration here.